Happy International Peace Month (ART-ACTIVISM FOR PEACE). We are all aware that September is the month of peace and in this month all nations, governments and organizations, writers, poets, artists and schools recognize the need for peace in and around their spaces. While we commemorate the PEACE MONTH, the Zimbabwe We Want Poetry Campaign word slingers continue to raise therir voice. We remind the Zimbabwean government under the corrupt, violent and hegemonic regime of Mugabe that PEACE begins with everyone else. That the talks for PEACE have to be walked not to be used as a propaganda rhetoric. We can’t forget the disappreance of social and citizen justice Activist – Bravest Voice ITAI DZAMARA. We lost a lot of MDC Opposition activists since 1998, more than 1,000 activists disappeared, maimed and were killed throughout the years. We are in solidarity with the all brave and powerful filmmaker, Art- Activism Creativism Expert, the VOICE OF REASON – Silvanos Bhanditi Mudzvova who was arrested, attacked and eventually abducted and left for dead in Nharira hills near Harare. We are also in solidarity with peace and justice activist/expert – Jestina Mukoko, the Founder/ Executive Director of Zimbabwe Peace Project. in honest pursuit of their people’s freedom. not guilty but perishing in incarceration. of our sold out resistance. A prayer I pray every day”. Coke and candy relieves the bile. from the cool fanned air. bring Nikita back to life. for a slender 16 year old. am I the consequence of poverty? like a mannequin who boasts her lost virginity. for a little girl parading at night”. the two must never become one. Nikita needs a trusted friend. coke and candy relieves rising bile. And off to school I go”. Do we need to be fooled my people? Yet you blaze in mist of soothe that is elusive. Hindrance and never the Fig be uprooted. were their gifts for perpetual praise. Hope and trust turned into invaluable treasure. This is a prayer we pray for every abused and lost child- to find their way to a safe place they can call home. From the story of Nyasha – This is based upon a true story – names have been changed. People out of their beds. allowing them time to rest. dust, smoke, rot and poverty. but a fortress for a soul in need. the thirsty, the lost and rootless. For the health of this nation. Pray and speak out against abuse, enslavement - corruption that has bound the hands of the people, stripping them of their livelihood. 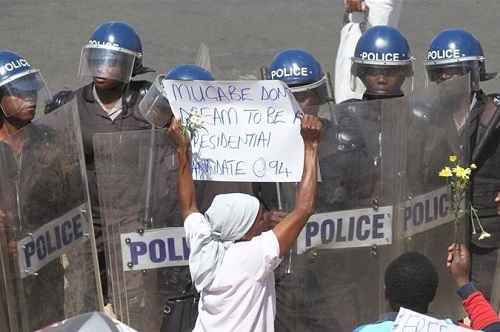 Zimbabwe needs her neighbours to feel her pain more intensely.